Most people naturally assume that its an easy life being the child of someone really famous. In many cases there’s no real need to work for a living and they’re bound to gain access to all the best clubs in town and be given good seats in restaurants. They are often set up in some nice corner of the fashion industry and helped along considerably by their star studded parents contacts. This view tends to ignore the fact that even the sons and daughters of celebrities have their own charts with their own personal issues that they have to deal with and confront. Whilst its true that the group of 916 members of Famous Families do sit highly on Capricorn Research’s Jupiter / Saturn index with a net score of 45 and therefore benefit accordingly, every person alive has to have a Pluto so no one gets off scott free. 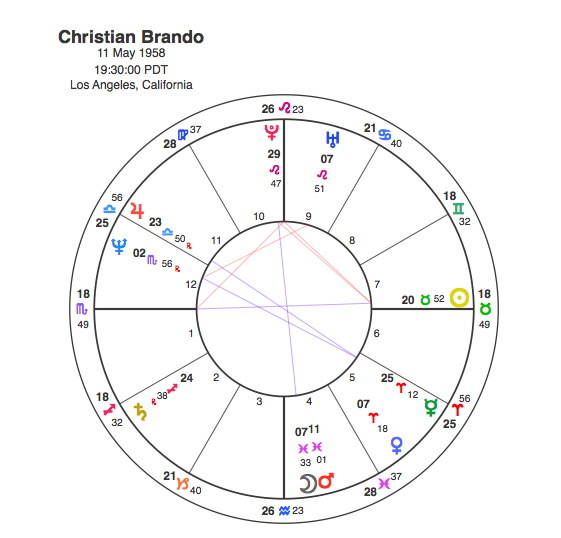 Christian Brando, the son of double Oscar winning actor Marlon, has probably suffered more than most famous sons but then he does have a particularly strong Pluto. Christian Brando has the Sun in Taurus in the 7th house. The Capricorn Research Project has proven that recognised public figures are less likely to have the Sun in the 7th than in other areas of the chart and those that have this position acquire fame through their relationships with others rather than through their own ambitions. Christian’s Sun is part of a powerful T Square based on an opposition with his Scorpio Ascendant. The Taurus / Scorpio polarity usually creates a strong minded and stubborn individual with a passionate intensity and considerable physical strength. It also suggests that personal one to one relationships will pull him strongly in challenging directions. Because this opposition focuses on an apex Pluto right at the top of the chart its likely that these challenges and tensions will have sudden aggressive and violent results and these events will dominate his life. Pluto is also opposite a Moon / Mars conjunction in Pisces in the 4th house, suggesting a turbulent relationship with other family members. That the Moon and Mars is in Pisces suggests that there would be something about these events that was both unclear and confusing. As ever when Pluto is involved in a natal relationship with other planets it’s most likely to be seriously triggered when it makes its next transit to them. Pluto’s next transit to Brando’s Sun and Ascendant was in 1990 – 91 when it was conjunct the Ascendant and opposite the Sun. In May 1990, Christian Brando shot and killed Dag Drollet, his sister’s lover. They were having an argument over whether Drollet was beating his pregnant sister, Cheyenne Brando. Christian was drunk at the time, he said there was a struggle and that the gun went off by accident. He was immediately arrested and charged with first-degree murder two days later. Cheyenne Brando had the Sun in Pisces in square to Neptune. Cheyenne was to be part of the prosecution case but she refused to testify and fled to Tahiti. Soon after her baby’s birth she attempted suicide twice and was hospitalized for drug detoxification in a psychiatric hospital. Cheyenne was declared “mentally disabled” by a French judge and was deemed unable to testify in her brother’s trial and without her testimony, prosecutors felt they could no longer prove that Drollet’s death was premeditated. They presented Christian Brando with a plea deal. Christian took the deal, pleaded guilty to voluntary manslaughter in January 1991 and was given ten years in prison. Cheyenne was later formally diagnosed with schizophrenia and her health steadily declined. In an interview given after his release, Christian stated that he doubted Cheyenne’s accusations of physical abuse against Drollet due to her mental instability. “I feel like a complete chump for believing her,” he said. The whole incident perfectly encapsulates the symbolism in the chart. Cheyenne is represented by the Moon ( pregnant female ) in the 4th house ( of the family ) in Pisces ( mental confusion and drug issues ). The Moon is conjunct Mars ( Cheyenne claims she was being abused ). Brando’s Sun in the 7th ( concern about a relationship ) brings him into conflict with Drollet. The result of all these factors is Pluto ( Drollet’s death ). Unfortunately no birth data are available for Dag Drollet but its a fair bet that there would be some Scorpio in there somewhere. The Moon in Pisces is moving away from the opposition to Pluto so this points to Cheyenne fleeing from giving evidence. As Brando’s Sun and Ascendant were opposite each other, Pluto only made one transit to them in his lifetime. Other planets did though and the movements of Uranus are particularly interesting. In 2001 with Uranus creating a T Square in square to both his Sun and Ascendant, Robert Blake’s wife Bonnie Lee Bakley was murdered. Blake was charged with the murder and the trial took place in 2004 – 5, by which time Uranus was conjunct Brando’s Moon and Mars. During the trial it was claimed that Brando was involved in the murder. Blake was ultimately acquitted in the criminal trial, but he was found liable for her death in the civil case. Testimony introduced during the criminal pre-trial hearings and the subsequent civil trial attempted to implicate Christian in the murder, suggesting that he had the same motive as Blake to have Bonnie Lee Bakley killed. Bakley had became pregnant and claimed to both Brando and Blake that they were the father. Pre-trial testimony alleged that associates of Brando were involved in the murder. The judge in the criminal case prevented the defense from presenting that view during trial. Brando was called as a witness in actor Robert Blake’s civil trial but refused to testify. Brando’s behavior in court got him a contempt of court charge and conviction. The civil trial verdict concluded that Robert Blake was liable for the death of Bonnie Lee Bakley. There are so many similarities with the Dag Drollet affair as the symbolism of the chart kicks in again. Again there is a murder ( Pluto ) based on a relationship ( Sun in the 7th ), there is a pregnancy ( Moon in the 4th ) and a refusal to testify coupled with some uncertainty around the verdict ( Moon in Pisces ). A number of other incidents happened around this time that tied in with the Uranus transit. Christian’s father, Marlon Brando died in July 2004. Christian married Deborah Presley in October 2004 but divorced after only a few months. In January Brando pleaded guilty to charges of spousal abuse and was sentenced to a rehabilitation program for drug and alcohol abuse as well as three years of probation. In December 2005, Deborah and her 13-year-old daughter filed a lawsuit “violation of their civil rights, assault, domestic violence, battery and emotional distress.” The suit for unspecified damages charged that he terrorized them by assaulting his wife and threatening to kill her daughter and their dog. The case was not settled because in 2008 with Neptune now creating a Tsquare to his Sun and Ascendant, Christian Brando died at the age of 49. Again, many of the same symbolic issues were raised including violence in a relationship ( Sun in the 7th square Pluto ) the involvement of a child ( Moon in the 4th ) and drug issues and some confusion over the end result of the lawsuit ( Moon in Pisces ). Its usually the case that the symbolism in a chart will keep cropping up and expressing itself through events in the person’s life. The major event will frequently be triggered by a Pluto transit but there can be many other similar ones through the life being set off by other planets movements. For Brando the T Square was so powerful it impacted in three quite separate events in his life but the themes were broadly the same and they were all trouble. Being born into a famous family certainly didn’t make life easier for Christian Brando. He might have had a very famous Dad but he had an even more notorious Pluto.